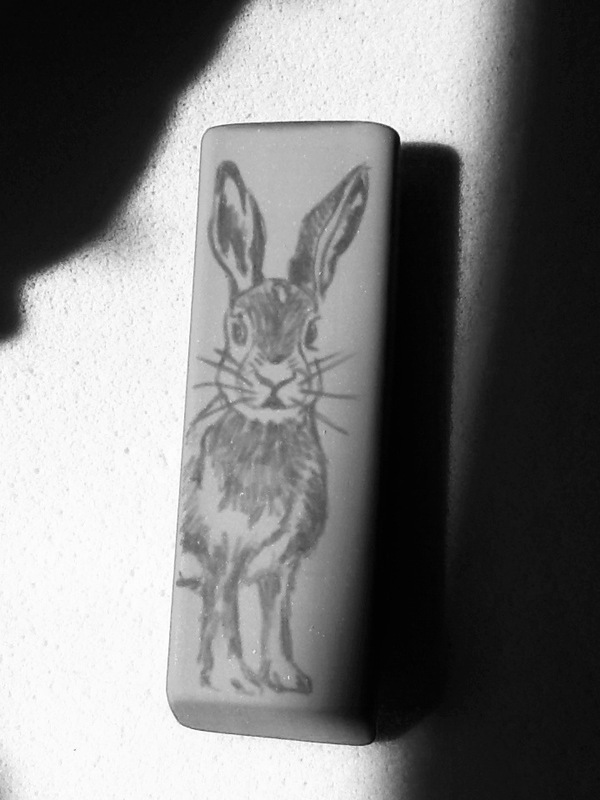 I bought a ‘Big Mistakes’ eraser a while back and have been wondering for ages what to draw on it so that I could do some carving. 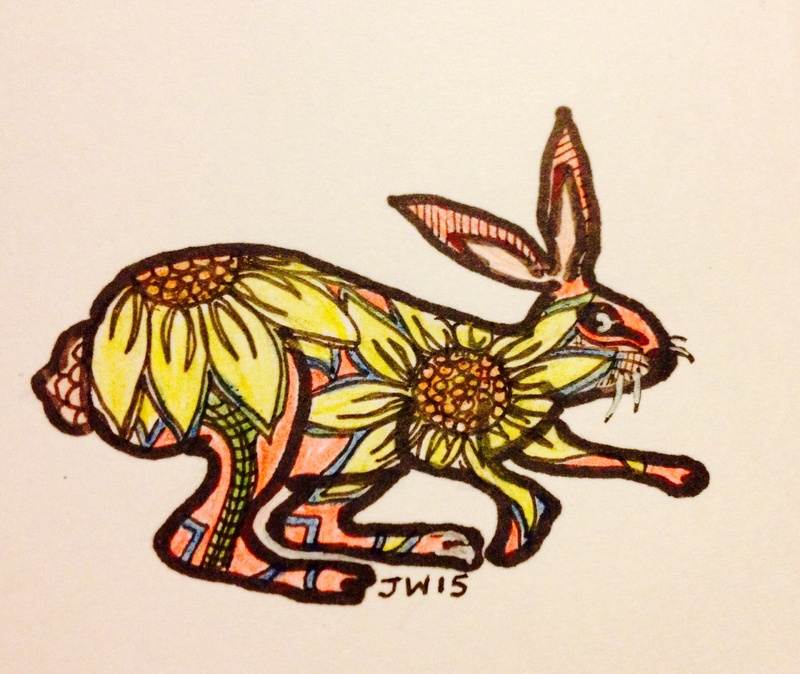 I guess I’m going through a bit of a ‘hare and rabbit obsession’ lately, what with buying a baby dwarf rabbit and watching her binkie around the living room; watching her ears twitch and turn as she listens out for unfamiliar noises. They sure are fascinating creatures. Yesterday, the family went to a wooded estate where deer were enjoying the sunshine and shade. 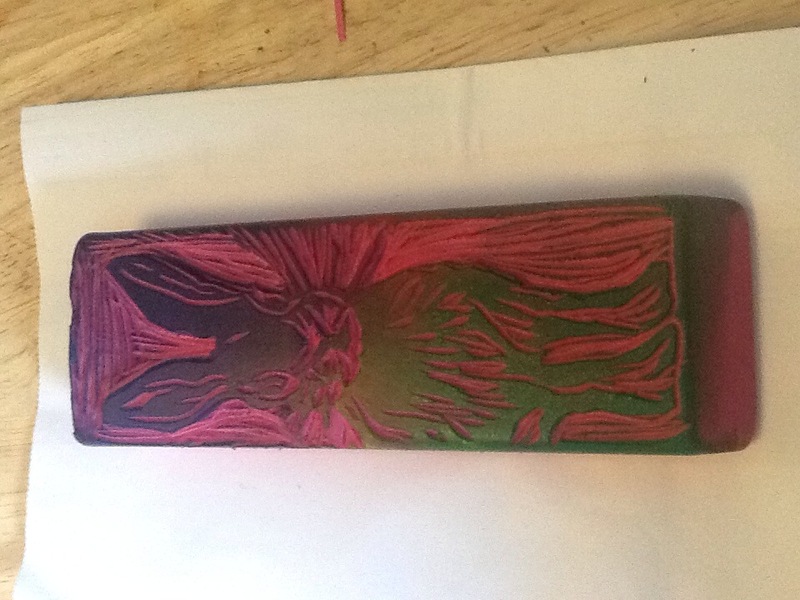 I could have decided on a deer for my print – maybe next time! 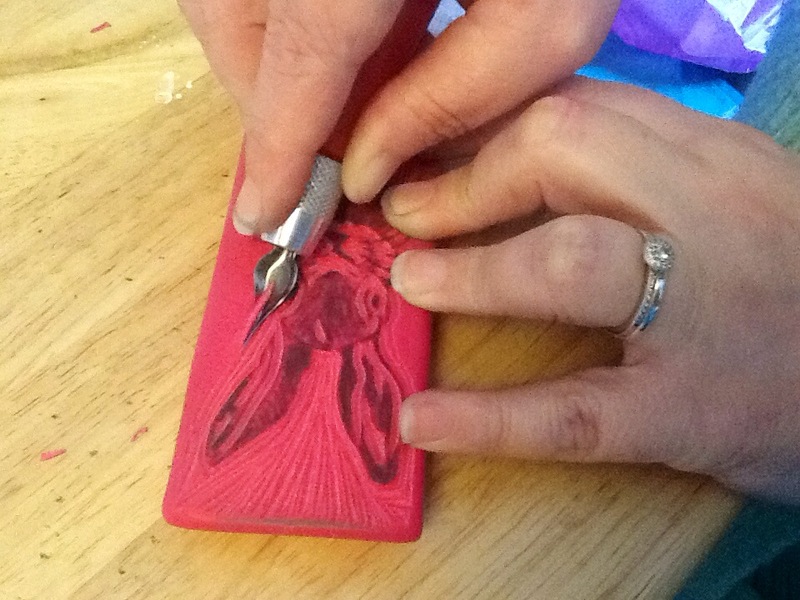 Still time to enter – free Christmas Giveaway! Tgis is just to remind you that entries are accepted here on WordPress too. All you have to do is comment on whether the limited edition print will be for you or a gift before the deadline tomorrow. Good luck. 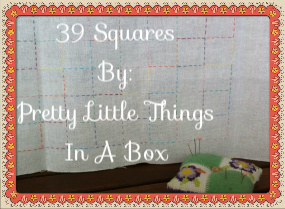 Hi and welcome to my blog, if this is the first time you’ve come across squarebird :-). Hello to all newcomers and old friends in the bloggesphere. First let me show you the actual lino cut I sketched out and cut this evening, then I’ll show it to you inked up for the first time. 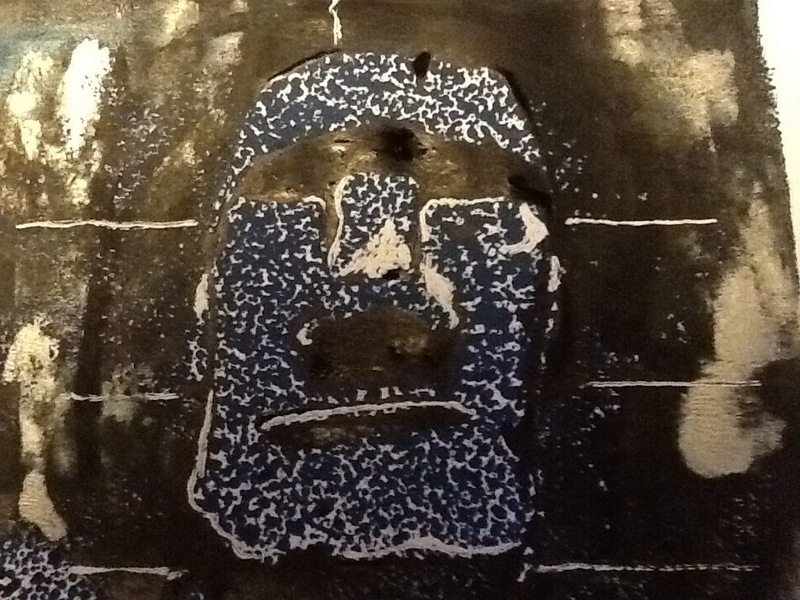 Finally, I’ll show you the limited edition lino-gelli print you have the chance of winning for yourself or a friend. 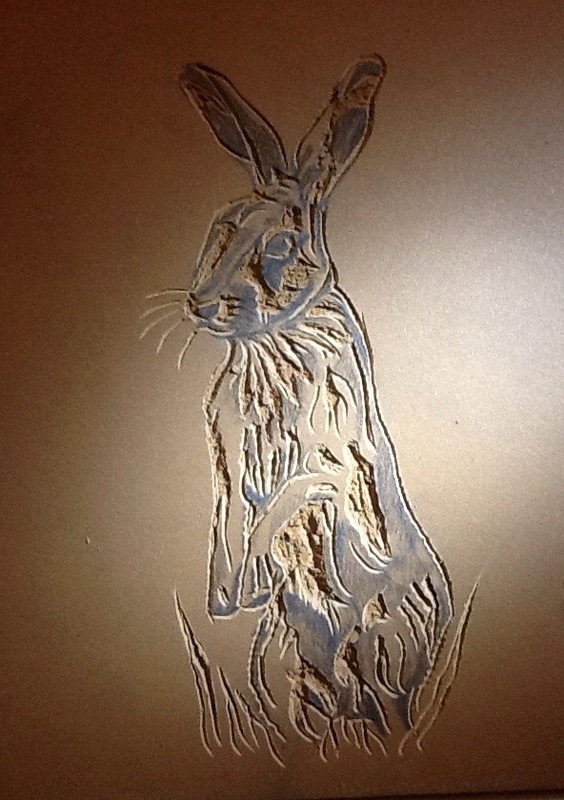 I chose to do a hare simply because I like nature and the hare is almost an iconic feature in the UK. 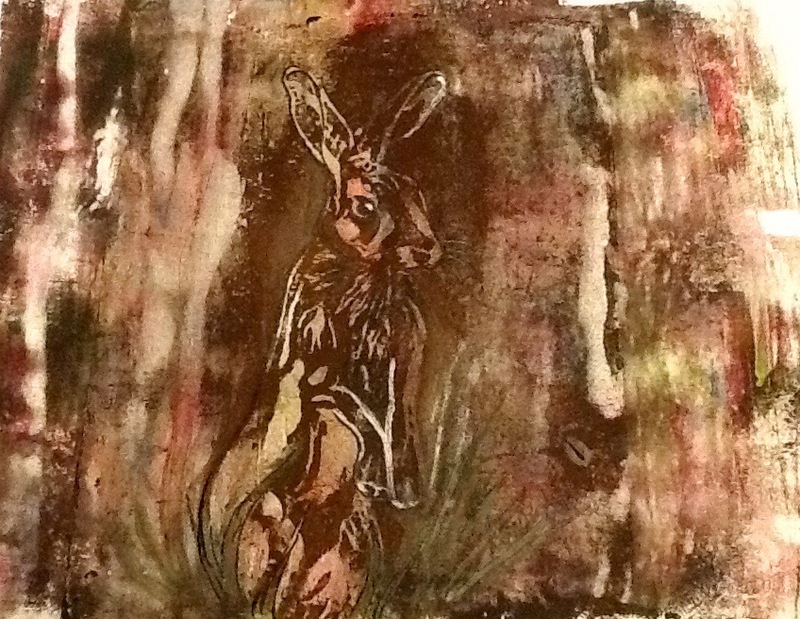 Once inked up with black, I found that I liked how the brown from the lino showed through against the acrylic paint. 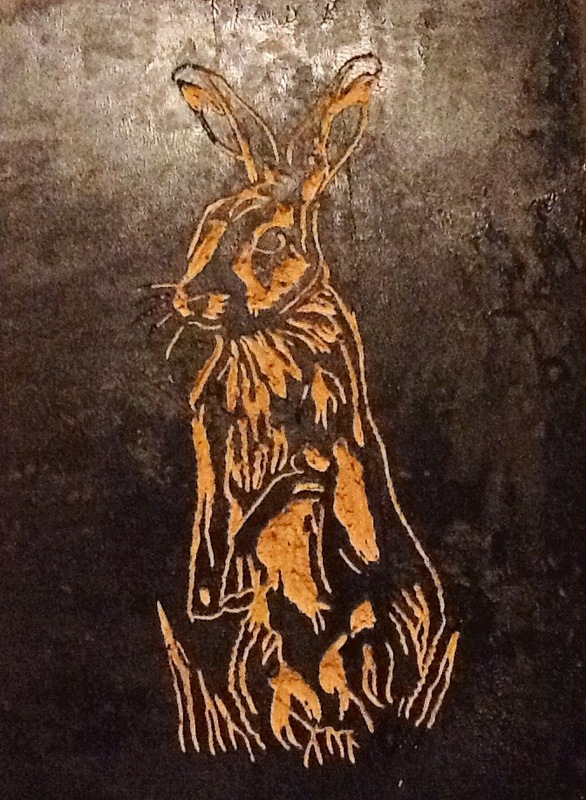 Finally, I began to play around with a Gelliprinted background and then printed the hare over the top. 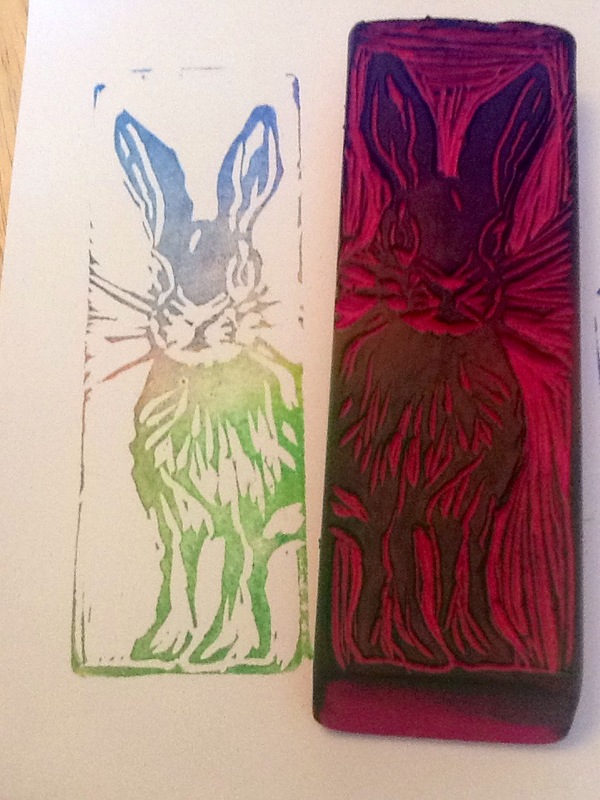 To win, all you have to do is comment after this blog post (or on my facebook page using the above link and commenting under the hare post) whether you would like to win it for yourself or if it will be a gift for someone. Entries will be accepted up until midnight Friday 12th December -all time zones and I will announce the winner (chosen at random) on Saturday. 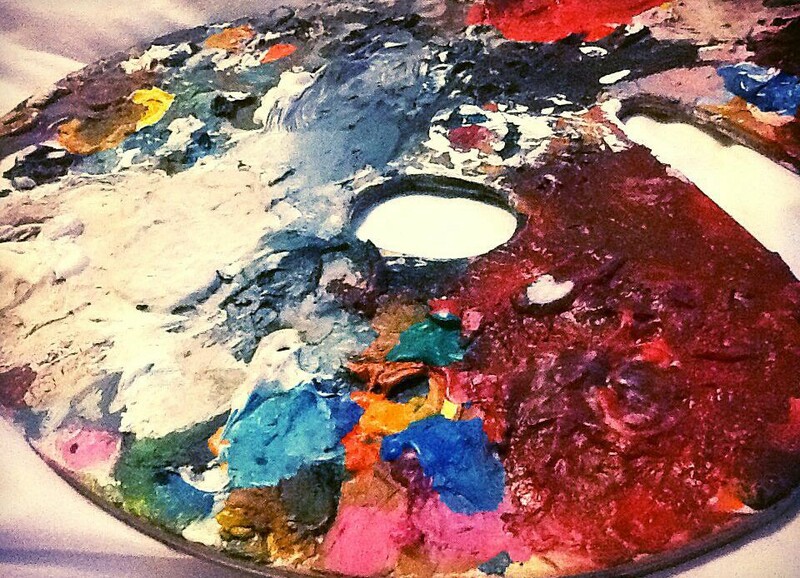 It’s been a busy day buying paint pot number three for my son’s bedroom. As you may remember, the first 5 litres of pancake mix coloured paint ended up in the footwell of my car and took more than three hours to clear up. The second pot we purchased was doubly wrapped by DH in plastic (witnessed by myself and my daughter). We bought this time andgrey. It went on as if I were painting a chalk board and I can only imagine my son’s comments. I hated it. Not only was the colour too dark, it was also too matt. Can you get too matt? I tried the grey. It went on like pancake mix … Too thin. I moved out from my son’s room and looked at the landing and stairs. Hmmm. Could work as undercoat! That’s where the grey went. He did tell me he didn’t want grey walls anyway. Nor blue actually (but he is getting one blue wall behind his desk). So today, we headed over to yet another DIY store and found rectangular paint tubs which stack neatly together. We opted for a blue called … Sky and a cream. Better. Thicker. Silk. One wall is now painted, the rest will have to wait until the morning. 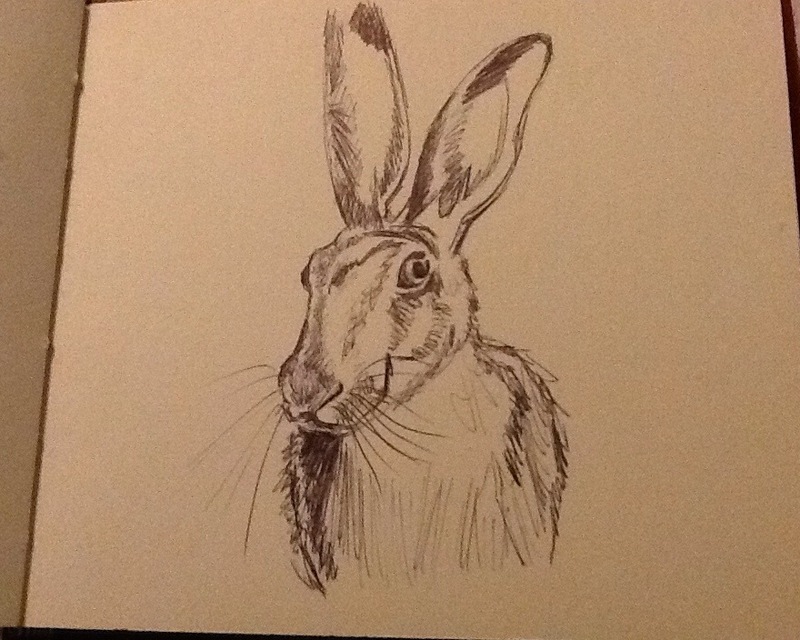 Hare today … I did a quick ten minute sketch in biro of a hare in my journal then had a go at the autumn journal prompt.